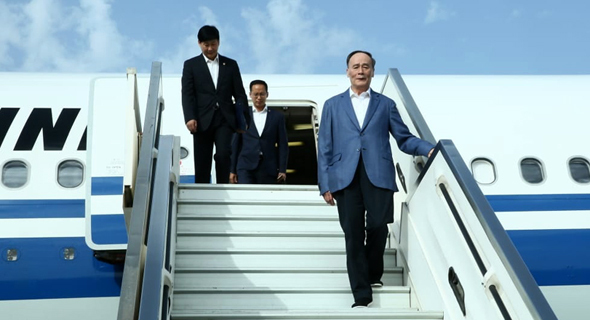 Chinese Vice President Wang Qishan will arrive in Israel Monday on an official visit to take part in the China-Israel Joint Committee on Innovation Cooperation, an initiative established in May 2014 to bolster Israel-China cooperation in domains related to innovation. Wang is co-heading the joint committee this year alongside Israeli leader Benjamin Netanyahu. He is accompanied by a delegation of representatives from 13 Chinese ministries. Israeli-Chinese ties have been tightening for the past few years as U.S.-China tensions continue to mount. Israeli exports to China reached $2.8 billion in the first half of 2018—8.7% of all Israeli exports—according to data from Israel’s Central Bureau of Statistics. The sum makes for a 73% increase year-over-year. According to Israel-based market research firm IVC, the number of Chinese players investing in Israeli tech companies nearly doubled between 2013 and 2017. Wang, known to be close to Chinese President Xi Jinping, was appointed as vice president of the People’s Republic of China in March. A former mayor of Beijing and a banker, he previously served as the secretary of China’s anti-corruption body, the Central Commission for Discipline Inspection. He is the highest-ranking Chinese official to visit Israel in at least a decade. His predecessor in the role of joint committee head was Liu Yandong, vice premier of China until March 2018. The committee will convene Wednesday in Jerusalem. Netanyahu and Wang are set to sign off on the initiative's new three-year plan. On Thursday, Wang will take part in the inauguration of the Israeli Innovation Center at the Peres Center for Peace and Innovation. Wang is scheduled to meet with Israeli President Reuven Rivlin on Tuesday, and visit Israel's Holocaust remembrance center Yad Vashem and the Palestinian Authority. He will attend a formal dinner at the prime minister's residence Monday evening. A U.S. delegation headed by Secretary of Treasury Steven Mnuchin is also currently on an official visit in Israel.